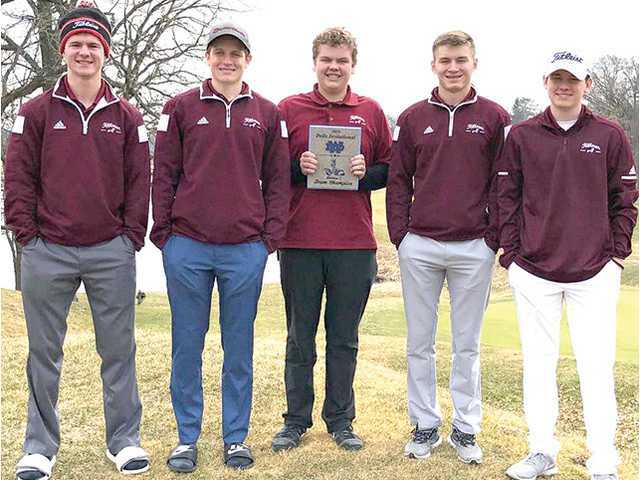 POSTED April 11, 2019 11:29 a.m.
WISCONSIN DELLS — Junior Nate Busch and senior Cade Rohrbach finished first and second to lead the Platteville golf team to the Division 2 team title over the weekend at the two-day Wisconsin Dells Early Bird Invitational. Platteville shot a combined two-day total (top four scores) of 460 (304–156) to win the Division 2 competition by 29 strokes over runner-up Osseo–Fairchild (322–167). Columbus finished third at 492 (360–172). “This tournament was a great way to start the season,” said Platteville head coach John Sponsler. “The golfers played great and represented the school and community well. Both courses were set up for scoring because the tees were up but the conditions were challenging especially starting early in the morning. Busch shot an even par 71 Friday afternoon on the 18-hole Coldwater Canyon course, then came back to shoot 39 Saturday on nine holes at Trappers Turn to win medalist honors by one stroke over his teammate with a 27-hole total of 110. The event was scheduled for two 18-hole rounds, but the reduced to 27 due to wet conditions on the Trappers Turn course. Rohrbach, the two-time Southwest Wisconsin Conference Player of the Year, carded a two-day 111 after rounds of 71 and 40 to finish second. Fellow senior Andy Eggers finished in a tie for fifth-place with a 119 (83–36). Senior Isaiah Altfillisch placed eighth with a 120 after shooting rounds of 79 and 41. Sophomore Connor Timlin rounded out Platteville’s five-man lineup with a 161 (109–52) to place 51st. “Nate and Cade shooting par on Say 1 showed their ability to close out a great round,” added Sponsler. “Cade’s mental toughness is unmatched and Nate puts in an extraordinary amount of time outside of season so it’s nice to see hard work pay off. Platteville is schedule to open the SWC season Thursday at Prairie du Chien. The Hillmen will then play in the Lancaster Invitational Saturday before returning to Lancaster Monday for the second SWC mini meet. Team scores — 1.Platteville 304-156=460, 2.Osseo–Fairchild 322-167=489, 3.Columbus 320-172=492, 4.Portage 340-176=516, 5(tie).Arcadia 356-180=536, 5(tie).Lodi 354-182=536, 7.Palmyra–Eagle 357-184=541, 8.Wisconsin Dells 365-185=550, 9.Wisconisn Dells 365-185=550, 10.Onalaska Luther 364-194=558, 11.Tomahawk 397-189=586, 12.Richland Center 389-203=592, 13.New Holstein 450-266=716, 14.Clintonville 465-254=719. Top individuals — 1.Nate Busch (Platteville) 71-39=110, 2.Cade Rohrbach 71-40=111, 3.Dayne Hensler (Portage) 78-38=116, 4.Drew Vold (Osseo–Fairchild) 78-40=118, 5(tie).Andy Eggers (Platteville) 83-36=119, 5. (tie).Austin Lietha (Columbus) 77-42=119, 5(tie).Marcus Herwig (Oregon) 79-40=119.